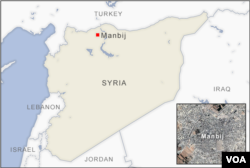 A suicide bomber barreled into a crowd outside a restaurant in the northern Syrian town of Manbij and blew himself up, killing four Americans and raising questions about what happens once U.S. forces pull out for good. The Islamic State terror group quickly claimed responsibility for Wednesday's attack, identifying the bomber as one of its Syrian fighters and said he had targeted a patrol of U.S. and coalition forces. Doctors in Manbij told VOA two U.S. service members were killed instantly. Officials with the U.S.-backed Syrian Democratic Forces said the wounded were rushed to medical facilities in neighboring Iraq. In a statement late Wednesday, the U.S. military said a civilian employee and a defense contractor were also killed in the blast.Three other troops were injured. Earlier, a spokesman for the U.S.-led Operation Inherent Resolve said the Americans had been taking part in "a routine patrol" when the attack took place. Video and photos of the site in the aftermath of the attack showed bodies on the ground and blood-stained walls. Witnesses at the scene said the attack took place near a restaurant where U.S. troops were known to meet with their coalition counterparts. The Britain-based Syrian Observatory for Human Rights said at least 10 civilians were killed in the attack, along with five U.S.-backed fighters. "Today is a stark reminder of the dangerous missions our men and women in uniform perform on our behalf each and every day," acting U.S. Defense Secretary Pat Shanahan told reporters at the Pentagon before a meeting with the Japanese defense minister. "Our fight against terrorism is ongoing," he added, refusing to take questions. "We will remain vigilant and committed to its destruction." Word of the attack quickly reached the White House, where President Donald Trump was briefed on the developments. "Our deepest sympathies and love go out to the families of the brave American heroes who were killed," Press Secretary Sarah Sanders said in a statement. "Our service members and their families have all sacrificed so much." FILE - U.S. Soldiers scan the area during a combined joint patrol in Manbij, Syria, Nov. 1, 2018. Trump called for the withdrawal of U.S. forces from Syria last month, saying IS had been defeated. 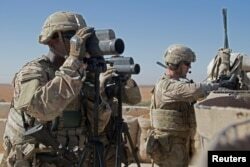 The Pentagon Friday confirmed it had begun pulling out some equipment from Syria, but that some 2,000 U.S. forces would remain in place until conditions on the ground allowed for them to leave. Dozens of U.S. forces are based just outside of Manbij, which has been a flashpoint between U.S.-backed Kurdish militias and Turkey. In a speech to U.S. diplomats Wednesday, U.S. Vice President Mike Pence insisted, "we're bringing our troops home." 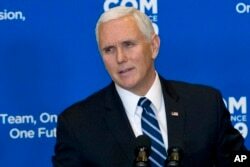 Vice President Mike Pence speaks during the Global Chiefs of Mission Conference "One Team, One Mission, One Future" at Department of State on Jan. 16, 2019, in Washington. Later, in a statement, Pence condemned the attack in Manbij, adding, "We have crushed the ISIS caliphate and devastated its capabilities." Some critics of the decision to pull U.S. forces from Syria said the attack should give the administration reason to reconsider. "My concern, by the statement by President Trump, is that you set in motion enthusiasm by the enemy we're fighting," U.S. Senator Lindsey Graham said during a hearing in Washington, noting he had previously visited the restaurant targeted in the attack. "I would hope the president would look long and hard at where he's headed in Syria," Graham added. "I know people are frustrated, but we're never going to be safe here unless we're willing to help people over there who stand up against this radical ideology." Other critics have said that while the Islamic State's self-declared caliphate had collapsed, IS itself was transforming into a capable insurgent force. Sources close to the U.S.-backed Kurdish forces in Syria said the attack was likely the work of a sleeper cell, and indicated efforts were underway to track down those who helped the bomber. "I don't think there is any doubt about the validity of the ISIS claim," said Raphael Gluck, co-founder of Jihadoscope, a company that monitors online activity by Islamist extremists, noting the speed with which the terror group claimed the Manbij attack as well as the details included in its statements. "As insurgents, ISIS are essentially saying, We can strike anywhere,'" he added. As of August, defense intelligence officials estimated IS still had between 13,000 and 14,500 fighters in Syria. And a United Nations report issued at about the same time likewise warned IS fighters were not breaking rank, saying the terror group's "collective discipline" was intact. "While it may not hold territory, it certainly has battle-hardened fighters and facilitators who have blended back into the local population," said Nicholas Glavin, formerly a researcher at the U.S. Naval War College's Center on Irregular Warfare and Armed Groups. Glavin, now studying at The Fletcher School of Law and Diplomacy at Tufts University, said it is also significant that the attack was carried out in Manbij, a town that has been regarded as somewhat of a success story since it was liberated from IS by U.S.-backed Kurdish forces in 2016. "It raises the question of how Manbij would fare absent the current U.S. force posture, given recent proposals for Turkey to establish a safe-zone in the region," he said. But Manbij has also been seen as a flashpoint between the Kurds and U.S. ally Turkey, which views the main Kurdish militia, the YPG, as a terrorist organization with links to Kurds in Turkey.